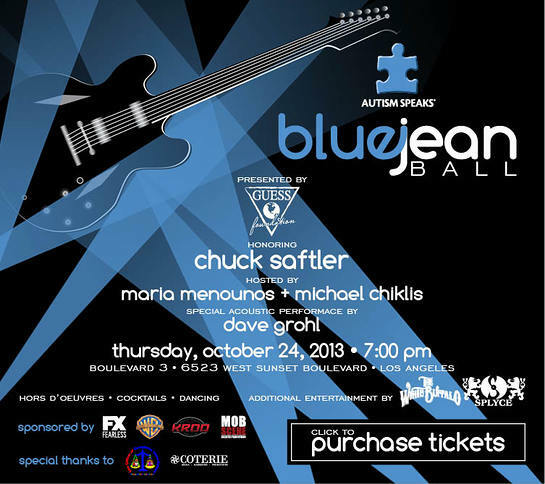 Autism Speaks, the world’s leading autism science and advocacy organization, proudly presents its third annual BLUE JEAN BALL, honoring Autism Speaks Board of Directors’ Member Chuck Saftler. Saftler, who is President of Program Strategy and Chief Operating Officer of FX Networks, is being honored for his dedication to autism awareness. Presented by The GUESS? Foundation, the BLUE JEAN BALL will take place Thursday, October 24, 2013, at Boulevard 3 in Hollywood. 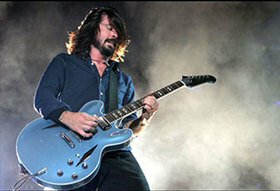 Dave Grohl will perform an acoustic set at the event. The headline attraction of the evening will be a special acoustic set by Grammy® Award-winning music legend Dave Grohl. In addition, The White Buffalo with singer/songwriter Jake Smith (Shadows, Greys and Evil Ways) will perform. Hosting the event will be television personality Maria Menounos (Extra) and Emmy® Award-winning Actor Michael Chiklis (The Shield, Vegas, The Commish). Artist John Matos (CRASH) will premiere a limited edition print dedicated to Autism Speaks. World-renowned DJ Splyce will be providing entertainment throughout the evening. The Autism Speaks BLUE JEAN BALL is dedicated to raising awareness and funds for innovative autism research and resources for individuals and families affected by the disorder. Tickets, sponsorship opportunities and additional information are available at events.autismspeaks.org/bluejeanball. “The BLUE JEAN BALL has become one of Autism Speaks’ signature special events and second largest fundraiser in Southern California,” said 2013 event Co-Chairs and Board of Directors’ members Nikki Pesusich of Coterie Media and Georgianna Junco-Kelman, Special Education Attorney. 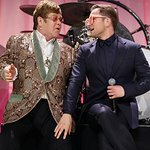 Past participants and honorees have included Sarah McLachlan, Toni Braxton, Paul Marciano, photographer Rob Shanahan, Sinbad, Brooke White, Raphael Saadiq, Sarah Shahi, Beth Reisgraph, Nikki Reed and Paul MacDonald, among others. Don't miss the 2013 Blue Jean Ball! Autism Speaks is the world’s leading autism science and advocacy organization. It is dedicated to funding research into the causes, prevention, treatments and a cure for autism; increasing awareness of autism spectrum disorders; and advocating for the needs of individuals with autism and their families. Autism Speaks was founded in February 2005 by Suzanne and Bob Wright, the grandparents of a child with autism. Mr. Wright is the former vice chairman of General Electric and chief executive officer of NBC and NBC Universal. Since its inception, Autism Speaks has committed nearly $200 million to research and developing innovative resources for families. Each year Walk Now for Autism Speaks events are held in more than 100 cities across North America. On the global front, Autism Speaks has established partnerships in more than 40 countries on five continents to foster international research, services and awareness. To learn more about Autism Speaks, please visit AutismSpeaks.org.